In the March chapter of Nigel Slater’s Kitchen Diaries, he notes that the 19th was the first day warm enough to eat outdoors. The year before, his first outdoor meal was on the 13th. Reading over the passage last weekend, I looked out at the patches of snow still blanketing the yard and figured that, this year at least, I was not going to be able to follow his example. This semester, I’ve been taking a German class at Temple University. Every Tuesday, my sister comes into Philadelphia to meet me on campus, and then we go out to lunch together. Our outings have mainly consisted of visits to the nearby Cosi, where we order cups of soup with flatbread baked in the restaurant’s hearth oven. Just the sight of the bright flames inside the oven cheers up a bitter winter day. This Tuesday was different. The air was balmy and the sun was shining. We still wore jackets, but there was not a hat or glove to be seen anywhere on campus. Instead of scurrying as fast as we could to the Cosi, we wandered along the rows of food trunks (a wonderful feature of Temple’s campus) and decided to get our meal from the crepe truck. Then we ate them, sitting side-by-side on a bench. Outside. The weather is supposed to turn cold again tonight. The last few hummocks of snow are still blighting the landscape, hideous icy mounds crusted with black grime. But I know spring is here at last. To me, the arrival of spring signifies the approach of Easter, with the six weeks of the Lenten season covering the fickle passage of the seasons: the first weeks might be cold and snowy, but the last belong firmly to spring. It’s a refreshing, invigorating time of year. Inspiring. Just the right time to get into the kitchen and experiment with some new recipes. 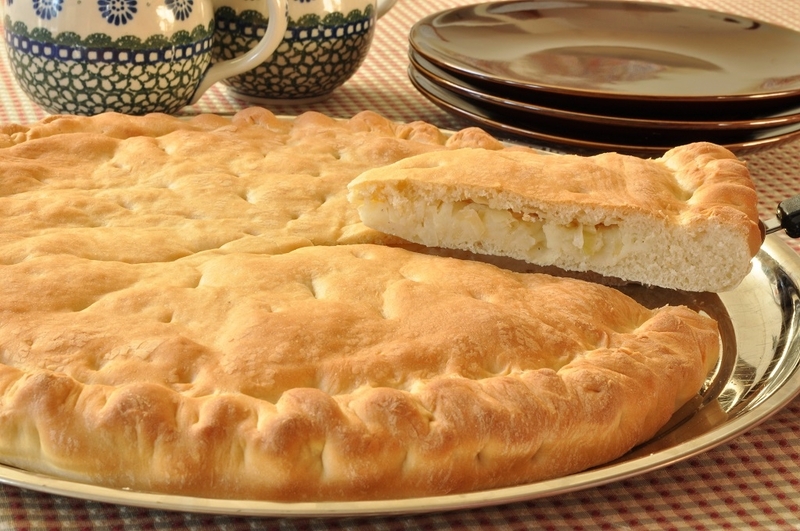 My latest find is this Ukrainian pagach, a dish traditionally served during Lent. Back in the days when strict fasting was required, it served as a hearty, but meatless, main dish. Technically, it should also be made without dairy products, but I took the liberty of substituting butter instead of oil, and I couldn’t resist the recipe’s suggestion to add some grated cheese to the potato filling “if not fasting.” I had bought some deliciously sharp Cheddar at my local market, and I couldn’t wait to use it. It was perfectly delicious. 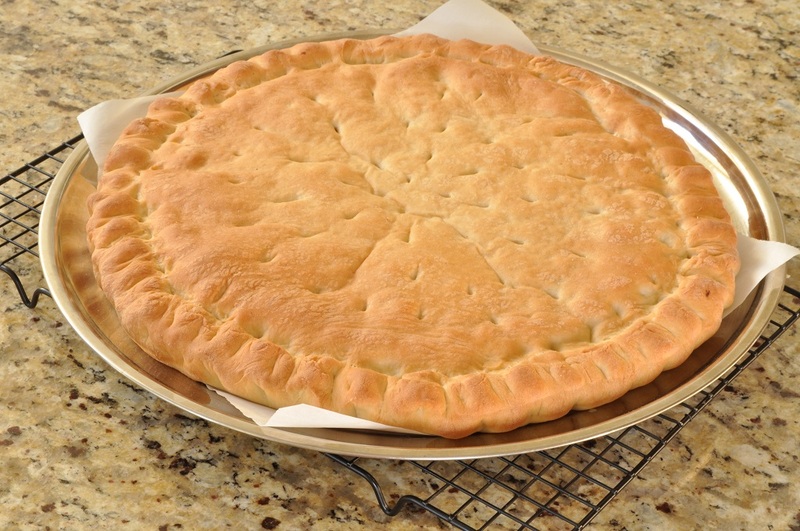 And the process of crimping the dough and making a decorative pattern of steam vents on the top is glorious fun. It is so pleasant to be able to make food look beautiful as well as taste good. 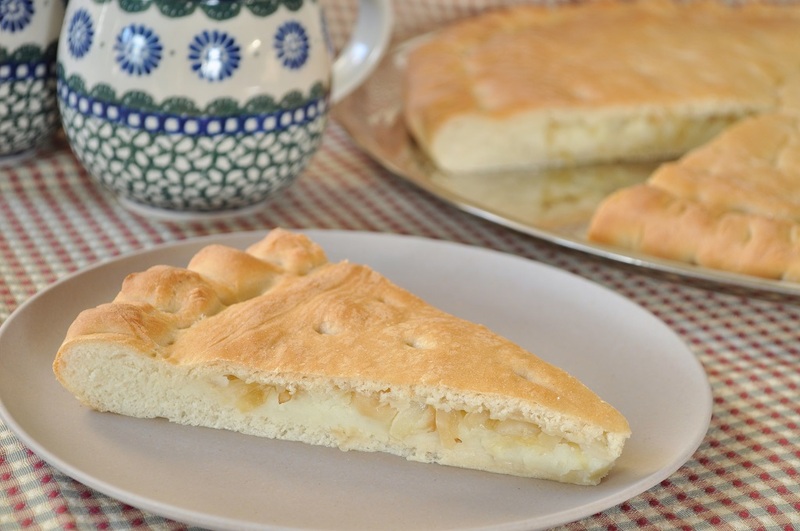 To serve the pagach, you can either eat it warm, with a fork and knife; or you can let it cool before slicing it into wedges, which you can then pick up and eat like slices of pizza. If you choose to eat it the latter way, this dish makes a very good on-the-run supper dish. It would also serve admirably as a picnic food—eaten outside, naturally. 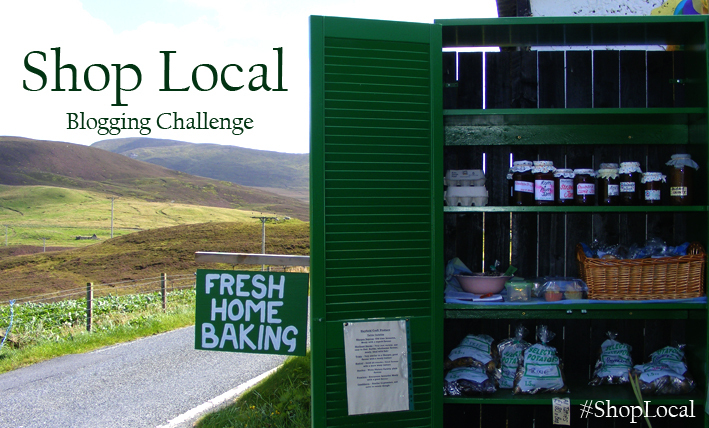 Since I used a local cheddar in the pagach, I am submitting it to the Shop Local challenge hosted by Elizabeth over at Elizabeth’s Kitchen Diary . . . which is now a blog hop! You can join by clicking on the link below. It is also my contribution to this month’s Alphabakes challenge, which is hosted by Ros of The More Than Occasional Baker and Caroline of Caroline Makes. We have reached the end of the alphabet now, and Ros is hosting the final letter, which is “U.” I immediately knew that I would either be trying a Ukrainian or Ugandan recipe, and the pagach won out. Although I did see a very interesting recipe for Ugandan peanut soup, which I shall have to try sometime . . .
Dissolve the yeast in ¼ cup of the lukewarm water with a pinch of sugar, and let stand until bubbly. Whisk the sugar and melted butter or oil into the remaining cup of water. Set aside. Place the flour and salt in the bowl of an electric mixer fitted with the paddle attachment. On low speed, mix in the sugar-water mixture and the yeast. Place the dough in a greased bowl, cover, and set aside to rise until doubled in size, about 1 hour and 30 minutes. While the dough is rising, prepare the fillings. 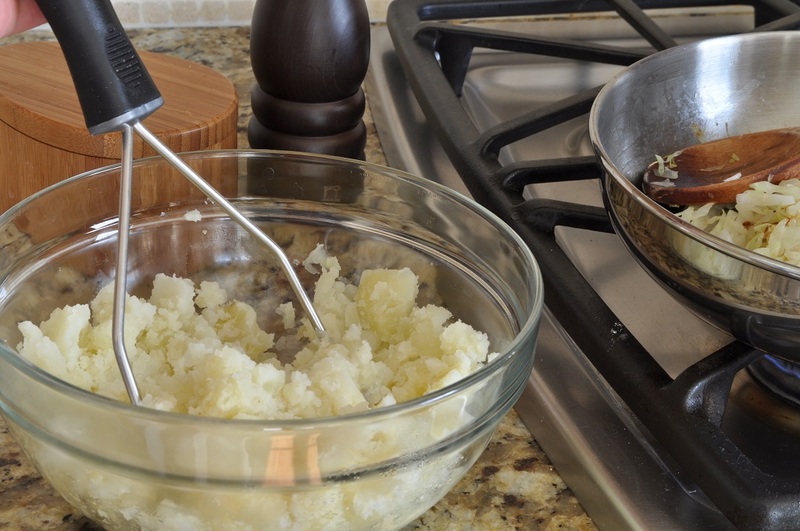 For the potato filling, place the chopped potatoes in a saucepan and cover them with cold, salted water. Bring to a boil and then simmer until tender, 15-20 minutes. Drain and mash. You should have about two cups of mashed potatoes. Mix in the cheddar and season well with salt and pepper. Set aside to cool. 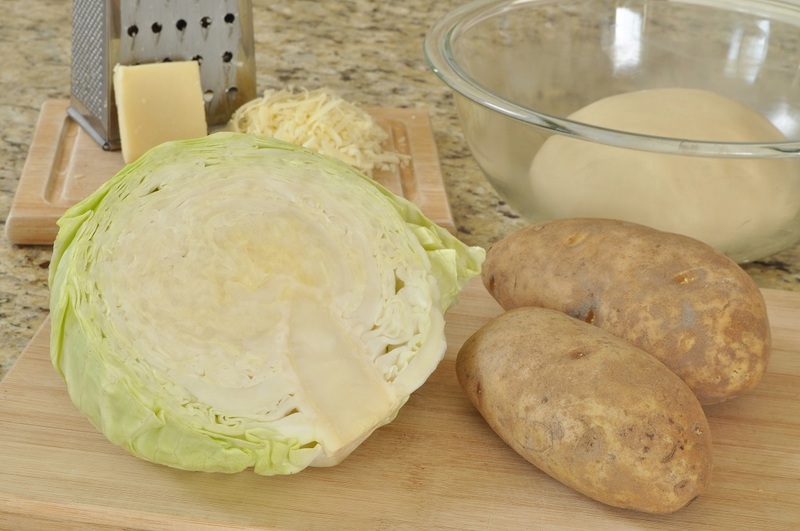 For the cabbage filling, melt the butter in a skillet over medium heat. 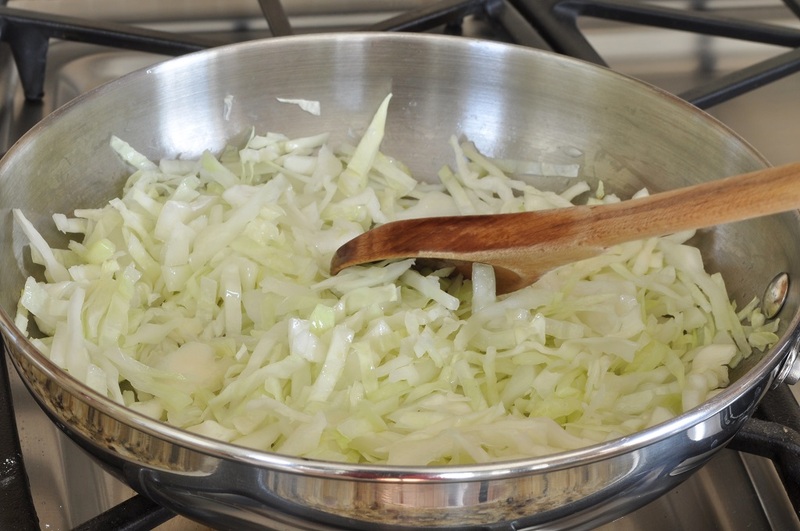 Add the cabbage and sauté, stirring occasionally, until tender, 12-18 minutes. Transfer to a bowl and let cool completely. 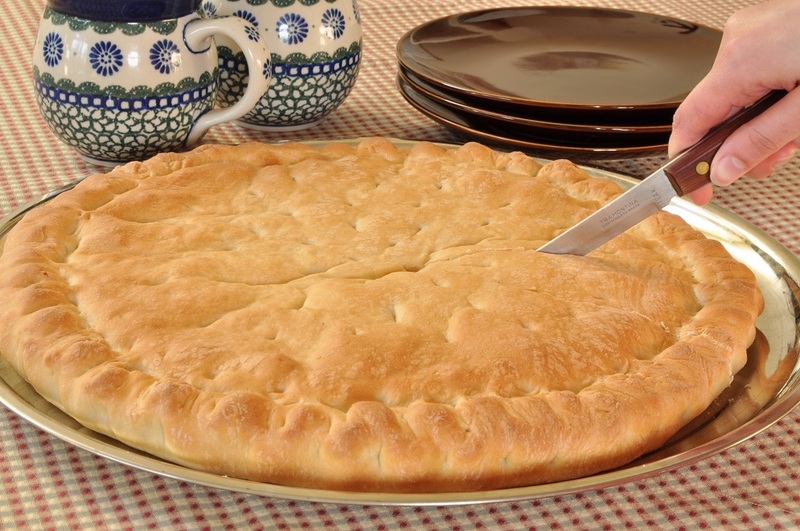 Once the dough is doubled in size, punch it down and divide it into two equal pieces. Cover them and let them rest for 15 minutes. Line a large baking sheet or pizza pan with parchment paper. Take one piece of the dough and place it on a lightly floured surface. Roll out into a 12-inch circle. 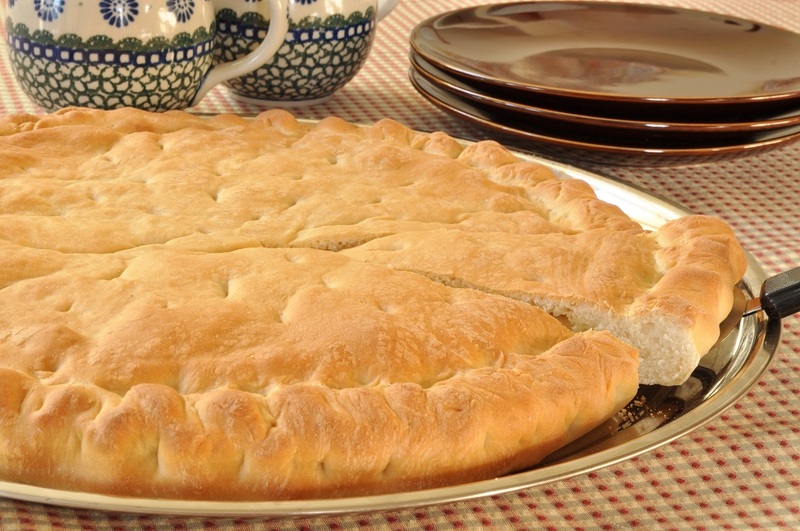 Place the circle of dough on the lined pan. Do not, like I did, assemble your pagach on the counter and then have to transfer it, gingerly, to the prepared pan. Thanks to some teamwork from my brother, I managed to do it without destroying its appearance, but the process was nerve-wracking. 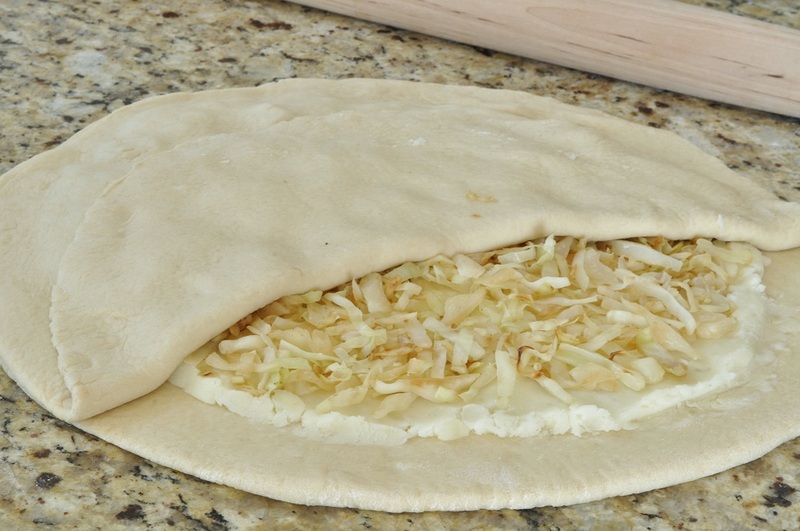 Spread the potato filling over the dough, leaving a 1-inch border. 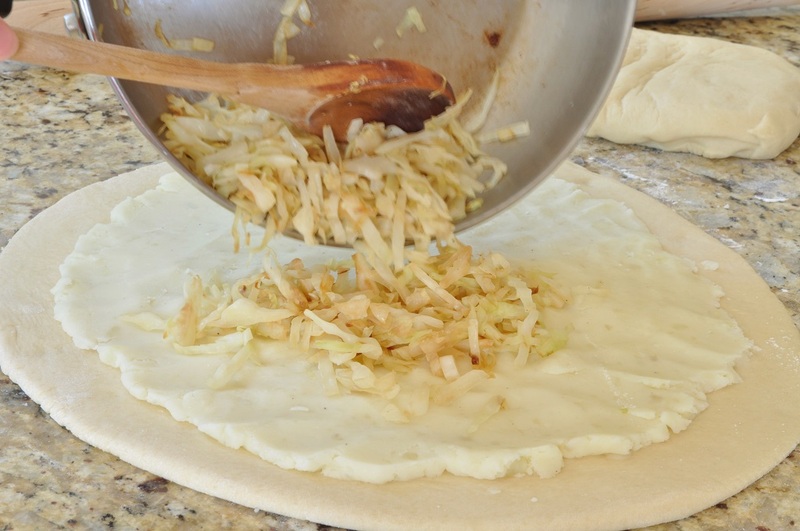 Sprinkle the cabbage filling evenly over potato filling. 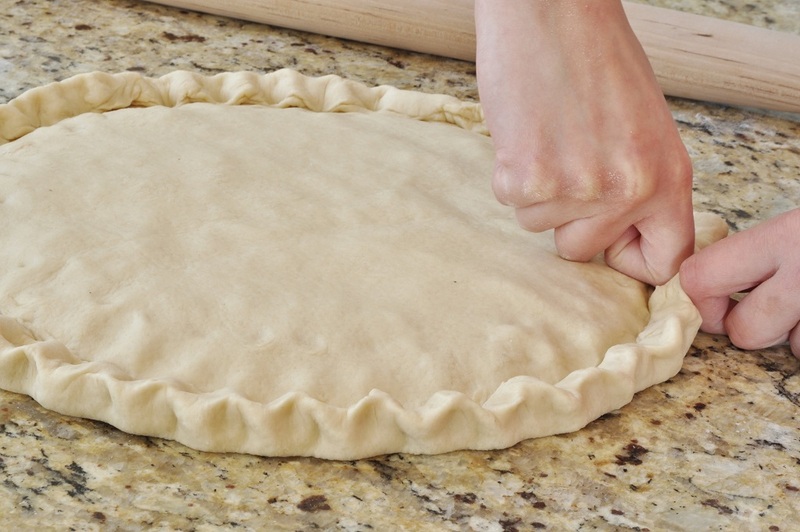 Roll out the second piece of dough into a 12-inch circle as well. Lift it up and carefully arrange it over the fillings. 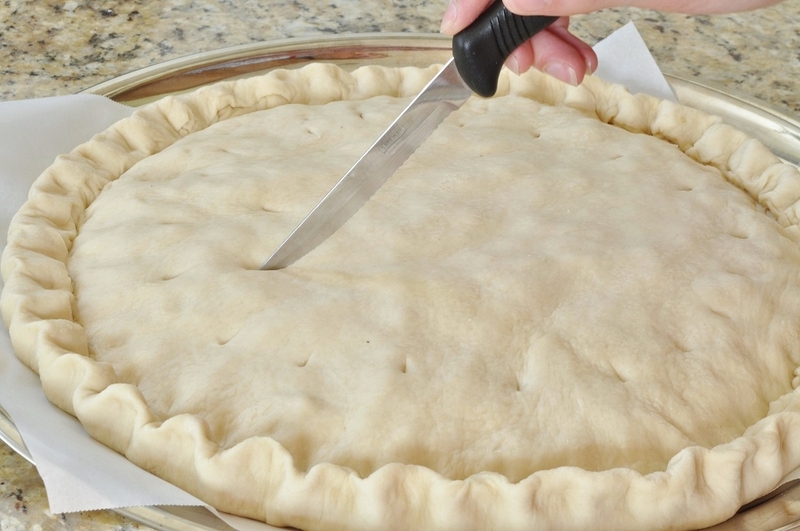 Press the edges of the top and bottom crusts together and crimp them to seal. Use the tip of a sharp knife to prick a decorative pattern of steam vents in the top of the pagach. Cover and set aside to rise for another 30 minutes. 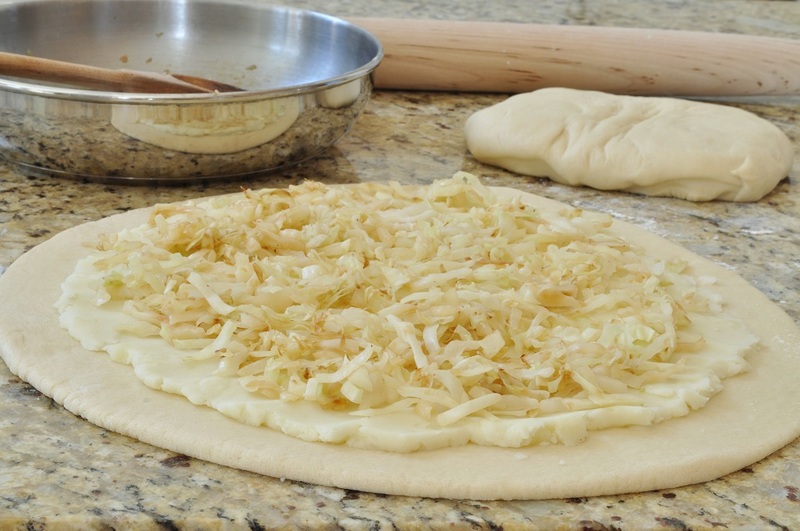 Place the pagach in the oven and bake until both the top and bottom crusts are deep gold, 25-30 minutes. Use the parchment to help you slide the pagach off the pan onto a wire rack. Let cool slightly. It sounds like a really tasty meal and I love the potato and cheese filling. It is delicious, and the cheese gave it just the right touch of indulgence! This is a brilliant idea for AlphaBakes! Perhaps you can save the Ugandan recipe for the next round. 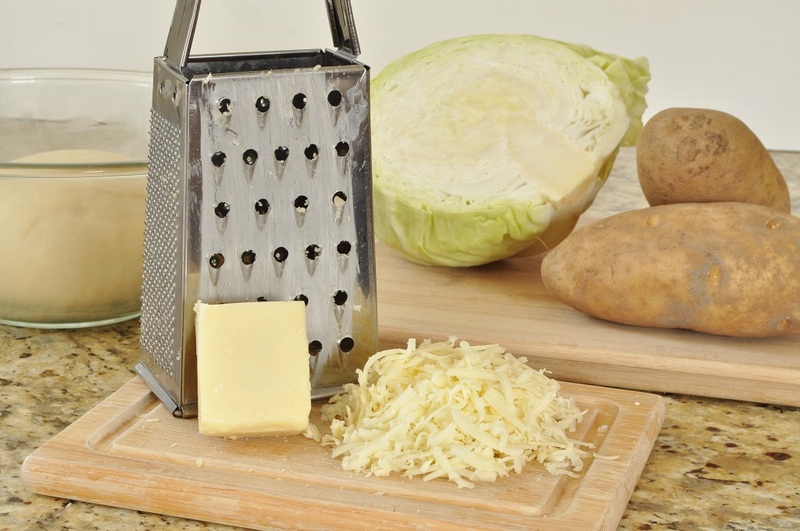 I love that you’ve used potatoes, cabbage and cheese and I really wish that I could taste a slice. Oh, that’s a good idea! I wonder how long it will take “U” to come up again? This is my first visit to your blog, via AlphaBakes. 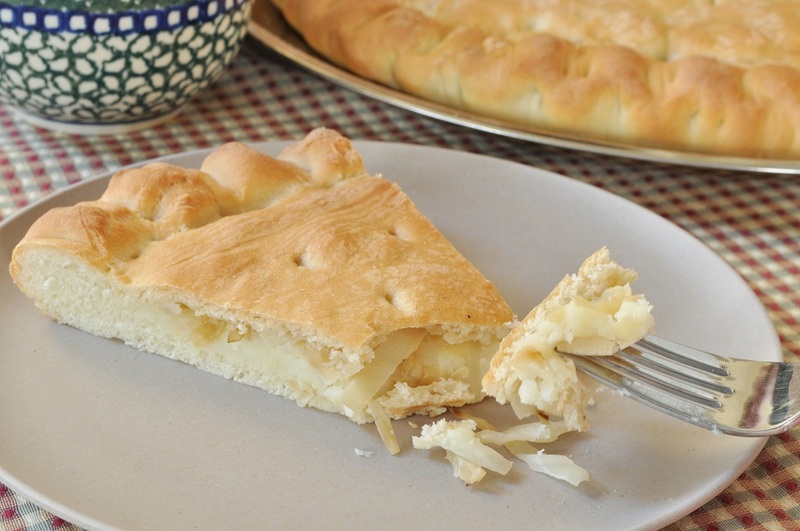 This pagach really intrigued me -it looks a tasty way to combine simple ingredients; I will have to try it soon. Thanks for stopping by, Suelle. Your Upside-Down Toffee Apple Squares look delicious–my brother would adore them, as he is a fan of all kinds of apple cakes. This pagach does indeed make an admirable light dinner. I’m very glad to have discovered it! Thank you, Elizabeth! I love participating in Shop Local; I’m so glad that you’ve organized it. And although the cookbook is a lot of work, it’s such great fun, too!